A Bird's-Eye History Of Walking On Stilts In 1411, the count of Namur banned the use of stilts in the Belgian city. Over the past 600 years, the elevated footwear has been used for everything from putting up drywall to fishing and even jousting. 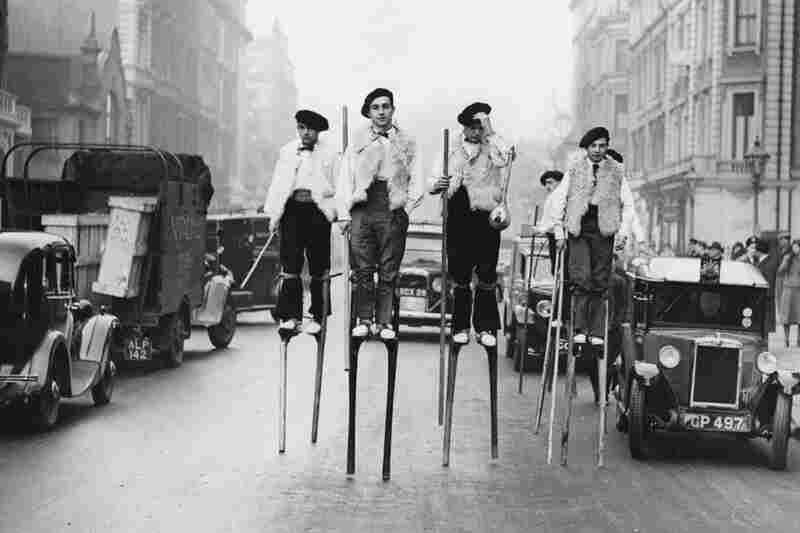 French stilt dancers from Landes, in southwestern France, walk through London on their way to the 1937 Silver Jubilee Festival of the English Folk Dance and Song Society. 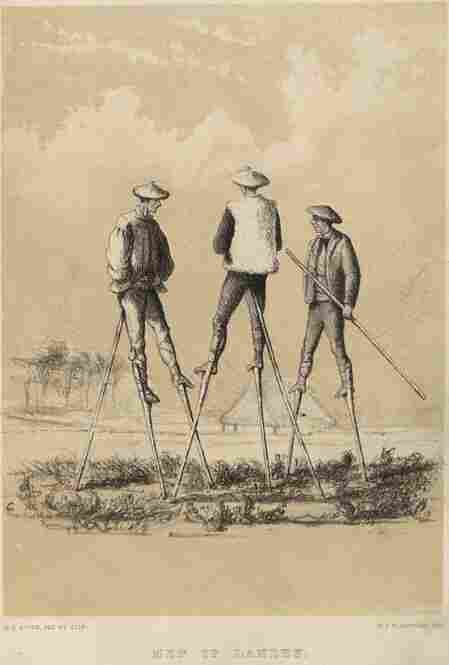 An illustration, circa 1800, shows men in Landes, France, walking on stilts to protect their feet from the marshy ground. 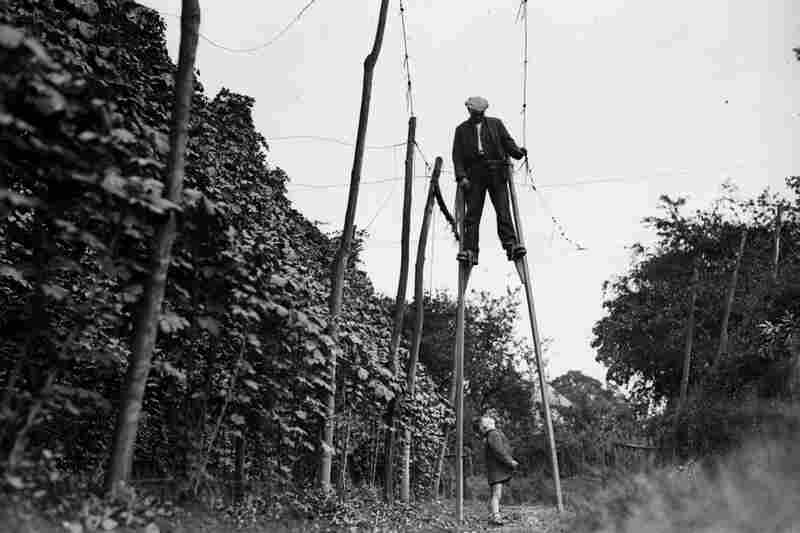 A stilt walker works in the hop fields of Wateringbury, England, in 1931. Hops grow on climbing vines and are used primarily in beer. 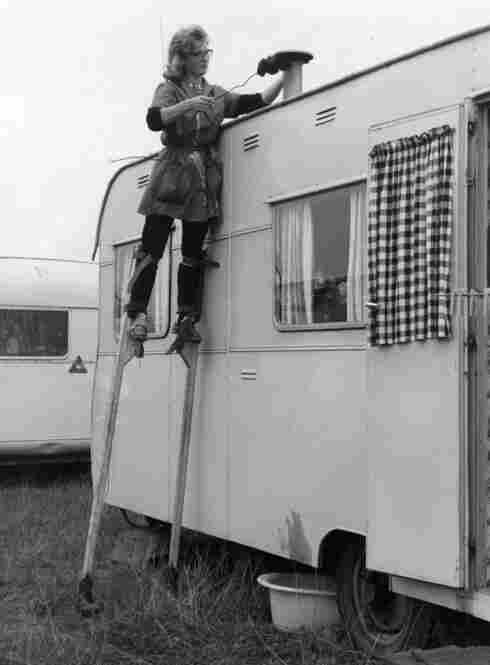 Stilt walker Joy Sloan cleans the chimney of a trailer belonging to a member of British showman Billy Smart's circus in 1963. 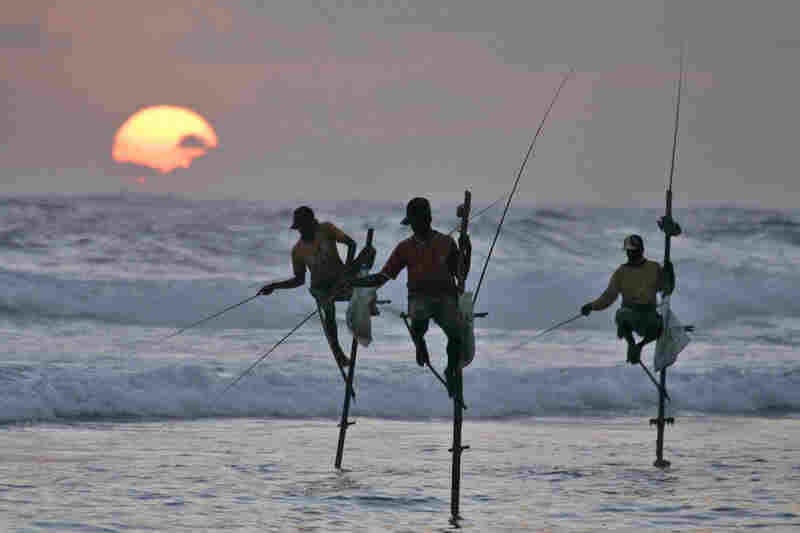 Fishermen use stilts to fish off the coast of Koggala, Sri Lanka. 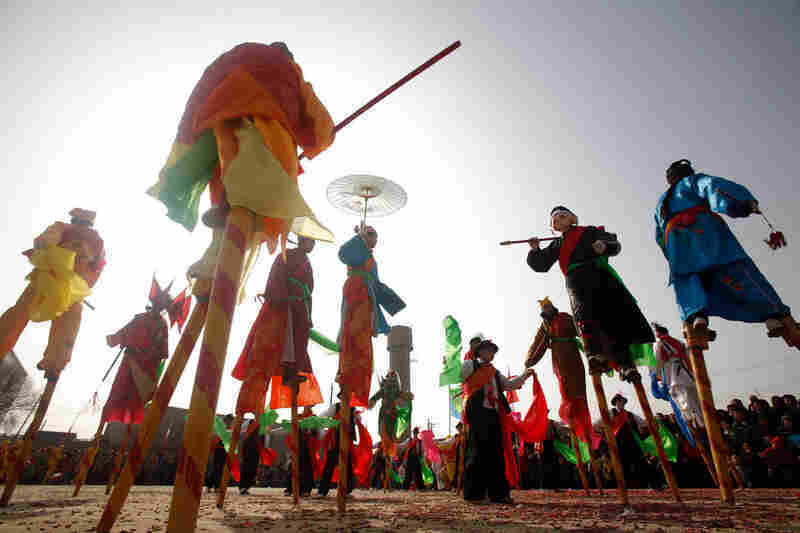 Villagers stilt walk during Shehuo celebrations in China's Qinghai Province in 2009. A couple of years ago, NPR's Robert Siegel had a 5-year-old kid moment. He was in the new wing of a hospital watching a workman put up drywall and, as drywall installers are wont to do, the workman reached the top of the wall by walking on stilts. The 5-year-old inside the radio host was suddenly enchanted by the thought of stilts, so Siegel set out to learn more; first through Google, then from Joe Bowen, who walked more than 3,000 miles across the country on stilts in 1980. "There's magic in stilts," Bowen says. "You get up 2 or 3 feet higher than anyone else. It becomes magic." Bowen says stilt walking has been around for a long time — and people are still doing it. He makes stilts available on his Kentucky farm for local kids to use. "There [are] probably 20 or 30 neighbor kids that walk on stilts to this day with me," he says. According to Colorado stilt walker Bill Coleman, aka "Stretch" the 9-foot clown, stilt walking also has many practical applications (on top of the drywall). "There [are] so many reasons to use stilts," Coleman says, "whether it's marshy or swampy ground, or for agricultural uses — stringing hops or picking fruit or pruning the trees." Not too long ago, shepherds in the Gascony area of southwestern France used stilts to oversee their flocks. And fishermen in Sri Lanka still use stilts to perch above the surf. Naturally, stilts also have nonutilitarian uses, especially among entertainers. But there's one nonutilitarian use that many likely haven't heard of. One team, the Melans, walk on stilts with black and yellow stripes while the other, the Avresses, use stilts with red and white stripes. The jousters use their stilts to swipe at their opponents' stilts in order to trip them up or knock them down. When only one team is left, the competition comes down to the individual, and the last man standing wins the Golden Stilt. According to Bertrand Patris, financial director of the Stilt Walkers of Namur, this year's competition also marks the 600th anniversary of stilt jousting in the city. "We have a document here in the archives of the city which is from December of 1411," Patris says. "It's a document where the count of Namur has decided that it was forbidden to use stilts in the city — and not only to use stilts, but to fight on stilts." So the people of Namur figure there had to be stilt jousting before that for it to be banned. And indeed, there are tales of teams of a thousand each competing in the city's central square. Patris won't speculate as to why the stilt walkers of Namur started jousting, but he does say that people tend to make games of everyday objects. And since the many rivers around Namur are prone to flooding, walking on stilts, he says, was common. And that's what makes stilts so amusing. In the evolution of transportation, their minimal survival is a tribute to their inherent unfitness. Stilts are a reminder that, in addition to inventing the wheel, taming the horse and engineering the bicycle, human beings have also come up with some truly bizarre means of transportation; and after all these centuries, those inventions are still good for a laugh — and, perhaps, some magic.